The iconic Chuck Taylor ALL STAR by Converse is a must have. This low version with a leather upper and classic shape remains a timeless and ageless design ! 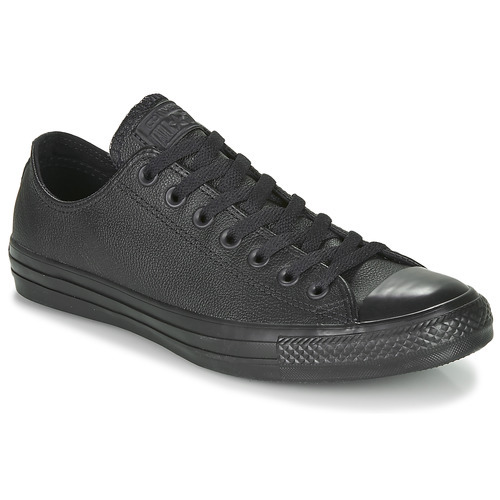 I have previously bought these trainers in black canvas and I thought they looked smart but these black leather ones look even better plus they're waterproof. Nice comfy trainers although the size seems a little bit on the large side compared to other converse models. I'd throughly recommend them and will probably buy another pair when these ones start to look a bit worn out. They look cool with black/grey jeans or chinos. Well worth the money. Bought these for my daughter starting high school. Really happy with the half sizing as you cannot get this on the high street. Shoes are great quality, and look amazing on.